Hundred-and-Eleventh Sidra՚, the dedication offerings for the altar continued. Hundred-and-Seventh Sidra՚ (Num. 4:21-5:10 continued from the previous parasha): The Sons of Gereshon, the Sons of Merari, a second census of the Levites, sending the impure out from the camp, and confession and restitution. The three clans of the Children of Levi have various duties and responsibilities in connection with the Mishkan. The responsibilities of the Sons of Ḳahath were discussed in Parashat Bemidbar while the responsibilities of the Sons of Gereshom and Merari, who are supervised by Ithamar the son of Aaron, are listed in this parasha. The Sons of Gereshon are responsible for the carrying of the coverings, hangings, and screens of the Mishkan and the courtyard. In the list of the responsibilities of the Sons of Gereshon the terms Mishkan and Tent of Appointed Times are interchangeable. The Sons of Merari are responsible for the carrying of the framework of the Mishkan and the courtyard including the bars, sockets, and clasps. A census is taken of the Levites from the ages of thirty years to fifty years - the age range for serving in the Tent of Appointed Times. YHWH tells Moses that the Children of Israel are to send out from the camp any male or female with ṣaruwaՙ, a flow, or who is impure through the impurity of human dead. Impurity within the camps would make them impure, and since YHWH abides in the midst of the Children of Israel their camps must remain pure. When a man or woman of the Children of Israel sins - being treacherous against YHWH - and confesses their sin they are to make restitution for the guilt that is on their head. In order to make restitution the item plus 20% must be returned to the one who was wronged. If the one against whom guilt was incurred can no longer be found, then the guilt is recompensed to YHWH and given to the kohen besides the ram of the sinners atonement offering. All the donations of the holy things of the Children of Israel, which they bring to the kohen, belong to the kohen. Hundred-and-Eighth Sidra՚ (Num. 5:11-31): The suspected adulterous - the case, the procedure, the curse, the offering, the consequences and conclusion. The Hundred-and-Eighth Sidra՚ is concerned with the ordeal of the woman whose husband suspects her of being unfaithful and committing adultery. The ordeal of the suspected adulterous is imposed by the husband if he is, a) sure that his wife has committed adultery but has no evidence or witnesses to bring a charge against her, or b) jealous of his wife and is suspicious that she is unfaithful even if she isn't. The kohen takes the woman's offering from her hand and elevates it before YHWH. He then brings it to the altar and takes a handful turning it into smoke on the altar. Hundred-and-Ninth Sidra՚ (Num. 6:1-21): The Nazir - regulations, defilement by a corpse, and the completion ceremony. One of the extraordinary vows that a man or woman can make is that of Nazir. The word נָזִיר [Nazir] comes from the root נָזַר [nazar], which means to dedicate or consecrate. Thus by taking up the vow of a Nazir an Israelite becomes consecrated to YHWH and by doing so increases their level of holiness. The vow of a Nazir can be undertaken for, a specific duration of time e.g. a year, until a particular event e.g. marriage, or even for an entire life-time. There are four avoidances imposed on the Nazir; i) alcohol intoxicants and their vinegars, ii) the produce of the vine, iii) cutting the hair, and iv) coming contact with a dead body. An Israelite who takes up the vow of a Nazir must refrain from drinking wine and beer or any other alcoholic intoxicant. They must also avoid vinegar produced from these products. Not only is wine - the fermented produce of the vine - to be shunned, but any other produce derived from the vine including grape juice, grapes whether moist or dried, vine leaves etc. The hair of the Nazir must be left to grow wild and cannot be cut or trimmed all the days of their vow, "until the fulfilment of the days that he shall be consecrated to YHWH holy he shall be" (Num. 6:5). There is connection between the root נָזַר [nazar] and the wild long hair of the Nazir, for verse 7 states that the hair of the Nazir is consecrated [נֵזֶר nezer] to YHWH [נֵזֶר - also means a crown, diadem, or a sign of royal power]. A Nazir cannot become impure through a dead human body as long as they are within the period of their vow, "All the days of his consecration; he is holy to YHWH" (Num. 6:8) and in this respect the Nazir is placed on the same level as the Kohen Gadol [High Priest]. For neither are permitted to become impure through human dead even if it be for a father, mother, brother, or sister. However, if a Nazir does become impure through human dead, "and makes impure the head of his consecration" (Num. 6:9) they are to follow the regulations for purification from their impurity of human dead and on the day the seventh day the day of their purification, the Nazir is to shave off all the hair of their head. On the eighth day the Nazir brings as an offering to the kohen at the Tent of Appointed Times two turtledoves or two young doves; one for a sin-offering and the other for an ascent-offering, "and make atonement over him, for that he sinned by the (dead) person; and he shall (again) make holy his head on that day" (Num. 6:11). The Nazir also brings a lamb in its first year for a guilt-offering and once these have been offered the Nazir is re-consecrated to YHWH. However if the vow was made for a set period of time the former days are not counted and the Nazir must start counting the days of their vow from the beginning. First to be offered is the sin-offering followed by the ascent-offering. Next the wellbeing offering along with the basket of unleavened bread, then the kohen offers the Nazir's gift-offering and libation-offering. Afterwards the Nazir is to shave the head of their consecration at the Tent of Appointed Times, and the hair is placed in the fire under the wellbeing-offering. The kohen now takes the cooked front leg of the ram and from the basket one unleavened round cake as well as one unleavened wafer, placing them upon the palms of the Nazir. The kohen then elevates them as an elevation-offering before YHWH, and the portion belongs to the kohen. "And after (that) the Nazir may drink wine" (Num. 6:20). Hundred-and-Tenth Sidra՚ (Num. 6:22-7:47): The blessing of the kohanim, the offering of the Nesi՚im, and the dedication offerings for the altar. "May YHWH bless you and keep you. May YHWH shine His face towards you and be gracious to you. "And they shall place My name upon the Children of Israel; and I will bless them" (Num. 6:27). The parasha informs us that the dedication of the altar commenced on the day that the Mishkan was erected, anointed, and sanctified, along with all its implements and vessels. The last sidra՚ of Sefer Shemot records that the Mishkan was erected on the first day of the First Month in the second year after the Exodus from Egypt; almost a year since they left Egypt. While the opening sidra՚ of Sefer Bemidbar informs us that the census took place on the first day of the Second Month in the second year after the Exodus from Egypt. Thus the dedication of the altar occurred prior to the census. 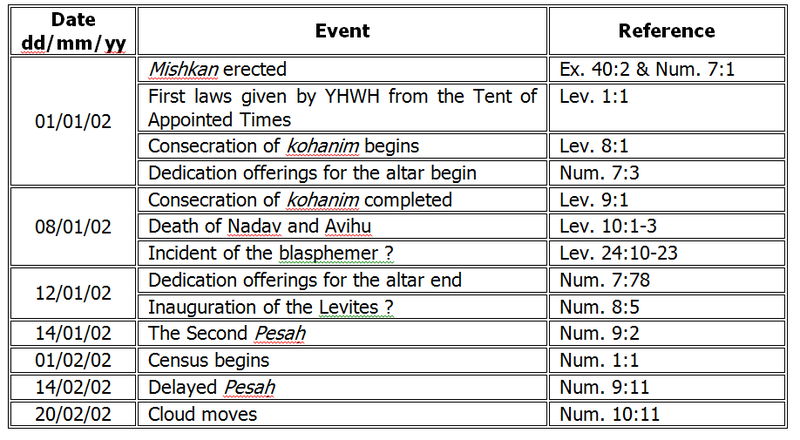 The events that took place from the erection of the Mishkan to the departure of the Children of Israel from Mt. Sinai are tabulated below in chronological order. The Nesi՚im [pl. of Nasi] of the tribes of the Children of Israel bring as a joint offering before YHWH: six covered wagons and twelve oxen - a wagon for every two leaders and an ox per leader. The wagons and oxen are brought before the Mishkan and dedicated to the service of the Tent of Appointed Times for the purpose of transporting the Mishkan and its vessels. The wagons and oxen are given to the Levites; two wagons and four oxen are presented to the Sons of Gereshon, while four wagons and eight oxen are presented to the Sons of Merari, both clans being under the authority of Ithamar the son of Aaron. However, the Sons of Ḳahath did not receive any wagons or oxen for they carry the Holy vessels e.g. the Ark of the Testimony, on their shoulders. Hundred-and-Eleventh Sidra՚ (Num. 7:48-89): The dedication offerings for the altar continued. "And when Moses would come into the Tent of Appointed Times to speak with Him, he would hear the Voice speaking to him from above the Purgation cover that is on the Ark of the Testimony, from between the two keruvim; and He would speak to him" (Num. 7:89). The monastic life is foreign to the pages of the Torah; there is no complete abolition of worldly pleasures. YHWH created man to enjoy the good world that He created. To deny its good bounty would be tantamount to denying YHWH's beneficence. Yes, the Torah does place parameters and boundaries around our more animalistic desires - we cannot consume blood and impure animals, nor can our sexual urges run wild - but they are just that; parameters and boundaries. There is no out and out ban, just a curbing. YHWH demands our participation in society and our appreciation of His wondrous creation. Therefore it comes as a bit of a surprise that the Torah would legislate for something like the extraordinary vow of the Nazir. Here we have a vow that can be undertaken by an Israelite man or woman, which entails the self-denial of various pleasures. However the obligations of a Nazir are not world shunning, just as keeping the Shabbath is not a denial of the world but an affirmation. The restrictions imposed by the vow bring the Nazir closer to YHWH. The Nazir has consecrated himself to YHWH, thus a higher level of purity needs to be observed - for ritual purity arises out of a sense of the extreme holiness of YHWH - therefore where purity is concerned the Nazir is placed on the same level as the Kohen Gadol. In their devotion to YHWH the Nazir needs to be level headed, thus the abstention from intoxicants as with the kohen who is on duty in the Mishkan; for is not the Nazir always on duty. Not only is wine forbidden to the Nazir but also the produce of the vine, for there is a connection between the Nazir and the vine. The word nazir [consecrated] is used for the undressed, unpruned vine (Lev. 25:5,11) in relation to the Sabbatical Year. Thus, just as the ungathered, unpruned vines in the seventh year are consecrated to YHWH so is the Nazir. It is a great pity that the vow of the Nazir, this wonderful way of being brought closer to YHWH, has become extremely rare in the ranks of the Children of Israel or maybe this fact symbolizes the lack of desire and passion for the closeness of YHWH that has become so common amongst the Children of Israel in this pre-Messianic Age.